A human boy and his best friend (a dog, naturally, albeit a magical talking one) go on wondrous adventures in the Land Of Ooo, interacting with a variety of princesses and often coming up against an assortment of monsters and the cold-hearted Ice King. Cartoon Network gets a lot of heat for having less cartoon content than it should, or for its lack of “classic cartoon” programming. But we must also give it props for the animated shows that it does broadcast. Over the years, the network has been home to a number of high-quality programs that deserve praise. Still, Cartoon Network has had to share cartoon-lover attention with other channels such as Comedy Central, and certainly Nickelodeon, who scored big-time with their Spongebob Squarepants phenomenon. Ah, but Cartoon Network now has bragging rights of its own, for it has perhaps the hottest all-ages hit of the past couple of years (as well as a multiple Emmy and Annie awards), the surreal and oddly splendid Adventure Time. 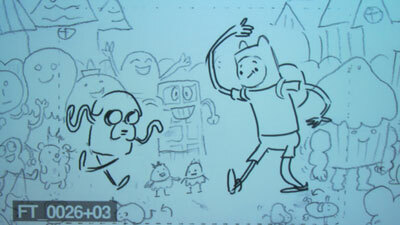 Creator Pendleton Ward, a CalArts grad, first mapped out the Land Of Ooo in a short by Frederator done for Nicktoons’ Random! Cartoons program, airing in January 2006. The Web version became an Internet smash, and a series was pitched to Nickelodeon. 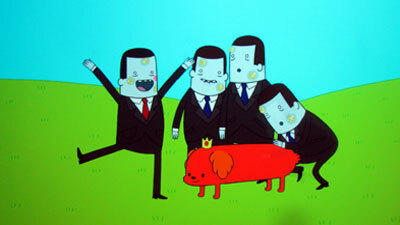 When they failed to bite, Frederator went to Cartoon Network instead, who bought the show after a period of development. It was an immediate success when it premiered in the spring of 2010, giving Cartoon Network an opportunity to finally snag the spotlight away from the invincible pop culture hero Spongebob. Typical of cable television, the seasons do not debut in the traditional fall period, so the show is already in its fifth season. It has already had a few DVD compilations, and a complete first season DVD set. Warner Home Video must have seen pretty good sales on those, because now they have not only put out the complete second season on Blu-ray, they have also separately released the first season in a high definition upgrade as well. Each episode runs a quarter-hour, and is shown with the show’s complete opening and full closing credits. 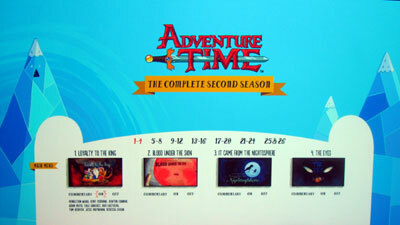 The seasons have 26 “episodes,” constituting thirteen half-hour blocks when broadcast. The first episode, Slumber Party Panic, throws viewers into Ooo with no explanations. Having only viewed snippets of the show before, I had been anticipating that the first episode would do something to introduce me to the bizarre world of the show, but nope. We just get dumped right in there, and are expected to simply keep up. And that’s fine, actually. The back story of the show gets developed very gradually, so at first there is little evidence of it being post-apocalyptic, taking place a thousand years after The Great Mushroom War. 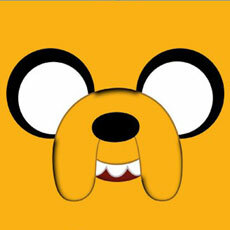 Initially, all we see is that it’s about a human boy named Jake, his speaking canine companion Finn, and they have… well, adventures! Their magical world is populated by all manner of strange beings, including an awful lot of Princesses. Jake himself is magical, with an assortment of powers that chiefly include metamorphosis. 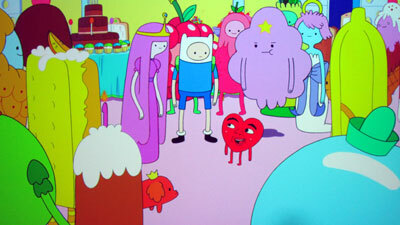 Slumber Party Panic sees Finn making a promise to Princess Bubblegum to not inform the residents of Candyland about her accidental igniting of a zombie apocalypse. The good candy people cannot know, because they explode when they panic, you see. When Finn later breaks his Royal Promise, another serious threat emerges, and he has to get out of that scrape too. Immediately, then, we find out that this is no ordinary kids’ show. In fact, it’s pretty weird. 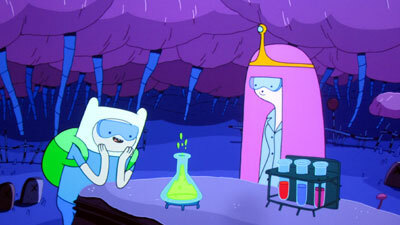 Finn and Jake’s prominent adversary The Ice King makes his first appearance in the third episode, Prisoners Of Love. Here we find out that he has a penchant for princesses, as he kidnaps a whole pile of them and holds them prisoner while he decides which one to marry. 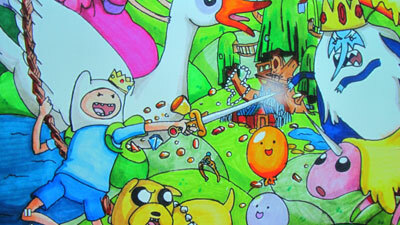 Naturally, it’s Finn and Jake to the rescue. 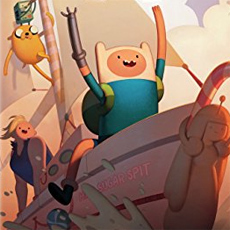 There is a dark undercurrent to the series, though the tone is very positive and Finn is the embodiment of plucky heroism. It is only in the eighth episode that we get our first hints about The Great Mushroom War. In Business Time, Finn and Jake are doing recreational iceberg melting as a sort of treasure hunt, and they melt an iceberg containing some diseased, almost insane businessmen who appear to be wearing 21st-century business suits. Suddenly, the Land Of Ooo is not simply a fairytale world, but a future version of ours, populated by what one can now assume to be either mutants or aliens. The history and mythology of this world is explored very slowly in coming seasons, though generally the episodes are all self-contained, and the focus stays on the main cast and individual adventures. 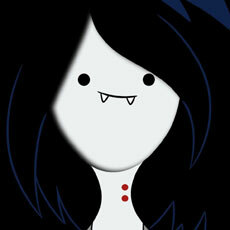 Another important episode in the first season is Evicted, which introduces the vampire queen named Marceline. 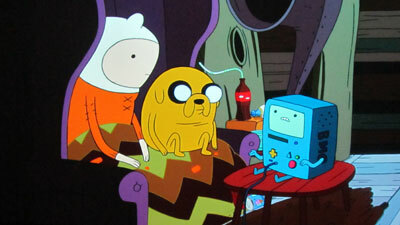 She forces Finn and Jake to leave their home, which they find out used to belong to her. 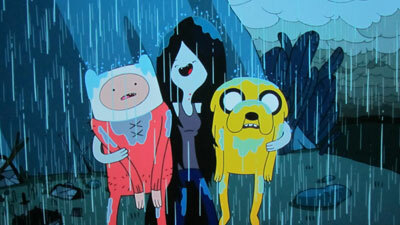 Marceline is typical of Adventure Time, in that she’s a hard girl to draw a bead on. Is she wicked? Playful? Crazy? Dangerous? Charming? Scary? Basically, she’s all of the above. She returns later in Henchman, where Marceline has Finn do her supposedly evil bidding before they cement their friendship. Elsewhere in Season one: A trip to Lumpy Space, a skeletal mermaid, a Gut Grinder, a warrior named Billy voiced by Lou Ferrigno, a heart played by George Takei, Finn being transformed into a foot, the wedding of The Ice King, and lots more wackiness. Well, at least it sounds wacky, but it’s all just a day at the office for our heroes. Maybe that’s what makes the show so bizarre— all the oddness is so taken for granted, it’s practically unsettling. The first episode on the second season set is another Ice King tale, Loyalty To The King, where the frustrated nutter shaves off his hair and beard, only to discover that no one recognizes him. Better yet (for him), the princesses of Ooo actually find him quite fetching. He takes advantage of this scenario by wooing the princesses, and he even engages the services of Finn and Jake to help him with small royal tasks. 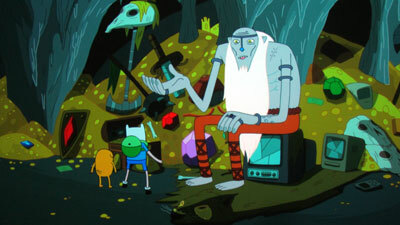 Though initially glad to be assisting such a regal new arrival to Ooo, Finn and Jake soon find out that he is not as noble as everyone thinks, and they eventually expose the Ice King for who he is. Later highlights include Slow Love, where the guys try to charm some lady snails into helping rid them of a pest problem. Finn gets kidnapped by an evil gnome (Paul Reubens) in Power Animal. The elephantine Tree Trunks returns in Crystals Have Power, where we find her trapped in a crystal dimension. The pair have a ninja duel against the Ice King in The Chamber Of Frozen Blades. Jake develops his relationship with Lady Rainicorn. There’s an evil bean that produces evil piglets. 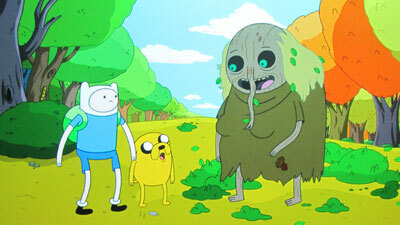 We even meet Death in one episode where Finn and Jake journey to the land of the dead to find the soul of Princess Bubblegum’s plant. A tribe of underground humans appears in Susan Strong. 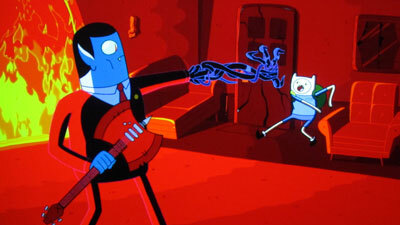 Just before the season wraps up, we get Heat Signature (which actually aired last that season, though it wasn’t meant to), as Marceline plays a prank on Finn and Jake that leads to ghosts wanting to eat their brains. See, that’s why you shouldn’t pull pranks. It’s all fun and games until ghosts try to eat your brains. There is so much more oddity to be discovered in these episodes, and no description can truly do the series justice. A two-parter (entitled Mortal Folly and Mortal Recoil) comes at the end of the season set. These episodes bring to prominence The Lich (voiced by Ron Perlman), a powerful undead wizard who becomes a major antagonist in the series. 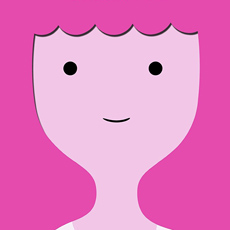 In the two-parter, he possesses and nearly kills Princess Bubblegum. One thing that becomes evident from watching the show is just how influenced it is by video games (see especially Guardians Of Sunshine and The Limit) and Dungeons And Dragons. 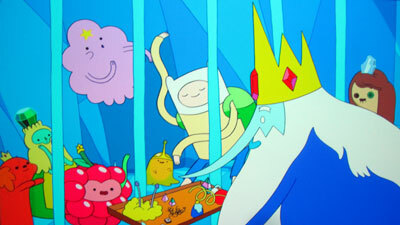 And perhaps that’s why I don’t quite connect with Adventure Time, since I’ve never understood the appeal of D&D, and am only a very casual video game player. 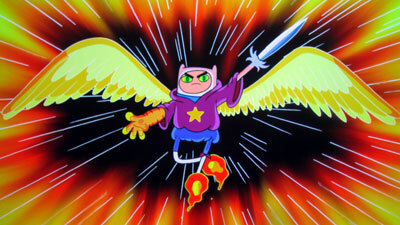 However, whether it is Finn brandishing his sword, saving princesses, or seeking The Armor Of Zelederon, the influences are apparent even to me. So, while I’m not sure if I’m a big fan of the show yet, I did appreciate the opportunity to look over these seasons. Adventure Time is certainly a fresh concept, and it generally embraces positive moral lessons, while presenting a heroic protagonist. Kids seem less bothered by the morbidity than I am— I suppose because of their lack of experience dealing with heavy issues such as nuclear war and societal upheaval. I’ve decided to look past those issues and see that the show has imagination to spare, and is unlike anything else out there; and those are certainly valid enough reasons to check it out. The best extras come on the first season disc, though naturally we first have to acknowledge the Trailers found at start-up, including those for more Adventure Time DVDs and new AT episodes on Cartoon Network; plus some for DVDs of Regular Show and Amazing World of Gumball. There are Audio Commentaries on four episodes (Trouble In Lumpy Space, Prisoners Of Love, Ricardio The Heart Guy, and Tree Trunks). There are numerous participants, who go back and forth from informative to tangential. Those that enjoy seeing early parts of the production process will enjoy seeing four different episodes get Animatics (Slumber Party Panic, The Enchiridion!, Dungeon, and Rainy Day Daydream), along with non-optional commentary. A Behind The Scenes Featurette With Pendleton Ward (9:38) has Pen Ward taking us through the studio to peek in at the creative staff. It’s shot with a cel phone, so don’t expect sparkling video. Also, those looking for Hollywood glamour may be disappointed, as Frederator is no Pixar when it comes to having cool digs. The featurette is almost as bizarre as the show, which I guess should come as no surprise. Everyone mugs for the camera, and there is a subplot of a merry quest to find Finn, who is up to some mischief in the studio. And, if you haven’t had enough of such foolishness, you may also watch Behind The Scenes Of The Behind The Scenes Featurette (2:32), and get a glimpse of a guy in a greenscreen suit. The last featurette is Adventure Time Music With Casey + Tim (10:10), which shows the fellows to be as eccentric as everyone else seem to be on this show. Video Extras include a Music Video (1:51), and a great piece called Finndemonium (2:02) that celebrates the show’s fans by showing us tons of cool fan art and cosplayers. Lastly, The Wand (2:07) is a mini-episode that in various places is referred to as either a webisode or promotional cartoon. 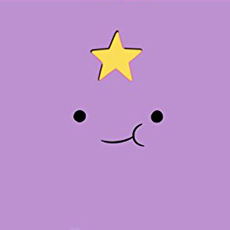 Regardless of its origins, it’s a little piece of Adventure Time that fans will appreciate, with a plot centering on a found magic wand. Each and every episode in this season gets an Audio Commentary with Ward and several other contributors. This is a wacky bunch that can’t always stay on topic, but it’s a nice excuse to focus on the show’s visuals without concerning yourself with following the plot. But beware— edits had to be made, and Ward filled the commentary dead space with ukulele solos. 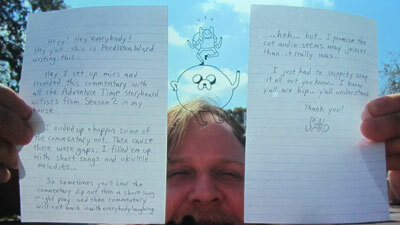 The Crew Of Adventure Time, Interviewed By Pendleton Ward (6:16) introduces us to several staffers on the show, all sitting by the same computer monitor and talking about themselves. The information value here is low, but it’s always nice to see some of the “little people” get their props. 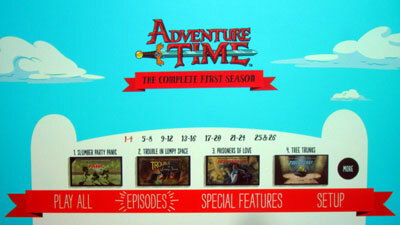 Each season appears in its entirety, plus bonuses, on a single Blu-ray. (The DVD versions on the market require two discs per season.) The standard Blu-ray cases each have a die-cut cover slip. Finally! Someone makes a reason for a cover slip to exist! 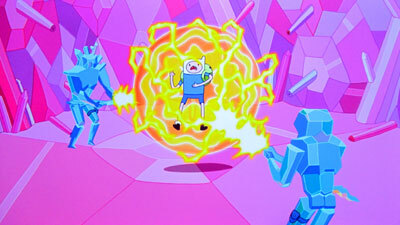 In this case, the removing of Season One’s slip effectively “removes” Finn’s headpiece, revealing his very full head of golden hair. 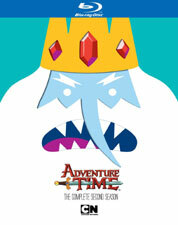 Doing the same for Season Two’s cover slip takes away the Ice king’s hair, a prelude to that season’s first episode. The cover slips also have different back covers than the standard covers, with the slips detailing the contents of each set. Overall, it’s a pretty spiffy packaging concept that shows some imagination and makes the initial pressing that much more collectible. Inserts offer Ultraviolet codes, ads for DVDs and the AT iPod video game, and most importantly episode listings. Those wishing to import the disc from overseas will be pleased to know that it played fine on my Region B machine (which I had to abandon temporarily when my PS3 started acting up), so the discs are likely all-region. Many will feel that going hi-def for hand-drawn television animation is unnecessary, and I understand those feelings, particularly if they have a smaller TV set. However, I long ago could see the benefit of 1080p for such programs, with both my 51” TV and certainly my 92” projector screen. 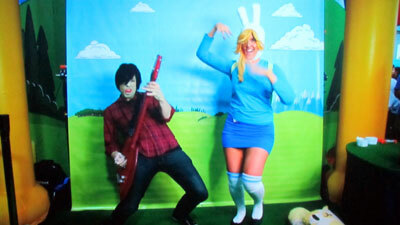 (You haven’t lived until you‘ve seen Adventure Time blown up to almost eight feet! The opening is dizzying.) With Blu-ray, the colors can be just that much brighter, and better yet a proper transfer should be devoid of any artifacts such as jagged outlines, pixelation, aliasing, or banding. Unfortunately, sloppy transfers or overburdening a disc with too many episodes can still lead to less-than optimal video. That was a potential concern here; but I’m happy to say that the folks behind this Blu-ray did it right. The image is basically perfect, with no distracting issues. It likely helps that there’s not really too much fast action in the show (except in spurts), and colors are simple, but whatever the reason I’m very happy to have these episodes looking as good as they do on Blu-ray. I was mildly disappointed that these episodes only have Stereo tracks, but then I need to remind myself of the show’s origins. I guess I’m getting spoiled, but 5.1 tracks would have been keen and brought the show to life all that much more. However, the stereo track serves up an adequate experience, though you will not be particularly dazzled by the audio. This show is definitely more about the visuals and the ideas. English subtitles for the hearing deficient are also available. It took me some time to warm up the unique experience of this program, but once I got into it I was at least close to being hooked, and definitely always curious to see what the writers would come up with next. Fans of the Adventure Time phenomenon will need little encouragement to pick these Blu-rays up, as they present the show with best-possible picture and sound, with each season amazingly available on a single disc. The extras add significant value, being both fun and informative, if in some cases being self-indulgent. Similarly, those just curious to try the show will find no better way to go if they wish to plunge head-first into a string of episodes from the very beginning. The reasonable pricing on these discs make them easy purchases to recommend.